Much has been made at the usual sites about Foreign Central Banks supposedly not buying US Treasuries. One has to always take these claims with a good dose of skepticism. 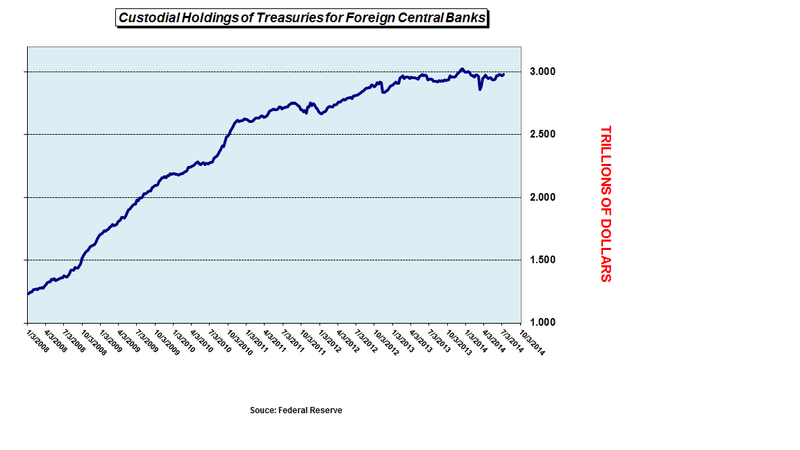 Here is an updated chart of the Custodial Holdings of US Treasuries by Foreign Central Banks. As you can see, after plunging lower in March of this year ( remember this was the result - so we were confidently told of Russia selling its Treasuries which supposedly heralded the end of the Dollar), Treasury buying has picked back up considerably. Treasury holdings at the beginning of this year were near $2.997 TRILLION. As of today, they are currently at 2.981 TRILLION. That is down $16 billion on the year thus far. Not much when all things are considered. It is going to be most revealing when we finally get the updated Treasury International Capital flows data for the month of June ( we will get that in August, next month) so that we can get a look into how the Treasury Department moves the allocation of Treasury holdings to the source nation instead of the intermediary nation. sold 1936, just above long entry point. I keep silver though. And my short on SP500 stop loss still 1970, neqrly stopped out twice. But KWN states a crisis of biblical proportions is coming very soon!!! KWN, the National Enquirer for pm bugs. 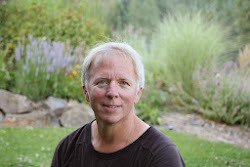 Eric King should be ashamed of himself for the irresponsible sensationalism and garbage slung on his website everyday. But maybe we are the idiots because we always mention his website regularly on this blog...which means we always read his website and Support his Advertisers. Bob, KWN just makes these stories up on the fly, especially when he fails to name the so called Johnny Come Lately Hotshot from wherever. Pretty lame, but it is what it is. The thirst and clamor for paper assets has never been higher. Central Banks are dumping commodities and buying sovereign "gladly pay you on Tuesday promise tickets" hand over fist. As well as "loading up" on equities as reported by Bloomberg. Never before in world history have we seen such "activist" coordinated policies by central banks around the world to print as much money as possible. Resulting in an absolute implosion in global commodity prices, as seen in the horrific collapse in the CRB index the last two weeks. Heh, Dan called it to the day on the top of crude, I am so grateful. While I always appreciate some kind words of encouragement, I cannot claim that I called any top in crude. I merely noted a huge imbalance in the speculative positioning of hedge funds ( along with another poster here by the handle of Jesse Livermore) and expressed my concern what might happen if a key downside support gave way and those computers started selling out of the longs. I have been of the opinion that there was no reason for crude to be at these levels given the state of the weak economy but specs have been wanting to own the stuff and have also been putting some geopolitical premium into it. That has been wrung out for now. I am curious to see if it can hold above the $100 level. Yes Trinity, it was a bull trap >$105 and now looking to find support @100 or so. As far as COT goes, it is only a tool, as the big hitters have gone OTC, thanks to Duffy and the CME selling us all out years ago. Even Steve Briese who wrote the book has been having fits trying to get right in these busted up mkts. Having said that, at least he is not as hazardous to your health as the San Diego Gann boys, who are making an art of throwing gasoline on their ill fated losers, time after time. A good weekend to all!! Looks like gold has some resistance at the1331-1333 level that was broken through yesterday. If the tensions in the middle east persist, this could become support. AU, AG, PT, PD, CU charts all look strong unlike other commod. We use the Treasury International Capital Flows Data to get a sense of which nations are buying Treasuries and which might be selling. That data comes out once a month and is dated two months back, so it is not especially timely. It does provide some insight however. I attach much importance to the June information ( released in August) as that puts the Treasury buying into the source nation and not into the intermediary nation ( where the Treasuries are purchased -not the source of the actual purchases). That will go a long way to either confirming the Belgium buying or not. My hunch is that the Treasuries in Belgium will be moved elsewhere to the source nation but I could be wrong. Just like a lot of buying was done through Great Britain ( London banks) in the past, it ended up moving to China during the June update. We'll see. Interesting that foreign holdings of US treasuries have risen 8-10% since the peak in treasury prices in July 2012 (the low in treasury rates). This was during the same period when the 5 yr fell 5% from 125 to 119, the 10 year 7.5% from 135 to 125, the 30 year 10% from 153 to 137. Apparently the Fed(?) was selling allot more than foreigner banks were accumulating the last couple years? Where would the Fed be (and treasury rates) without these foreign purchases?